You may have noticed the thingy on my side bar (over there-->) that links to the Liz Logelin Foundation. You may have also seen my link to Matt Logelin's blog over there as well, and if you've read his blog at all I'm sure you, like me, shed a few tears and fell completely in love with them both. I don't know them in "real life," though I feel as though I do. Madeline was born very tiny and premature in 2008, about a month before my Lucy arrived. Maddy's momma, Liz, died suddenly the next day from a pulmonary embolism. Matt, Maddy's daddy, is now raising Madeline alone and blogging all about it in a brutally honest and poetic way. I found his blog back in the summer and stayed up for hours catching up on the story. I wept like a child... my heart was just broken for him. But over these past months, it has been really amazing to watch Madeline and Matt grow together. As more and more people discovered his story, his readership has grown enormously. Mostly, I just love looking at the pictures of little Madeline. 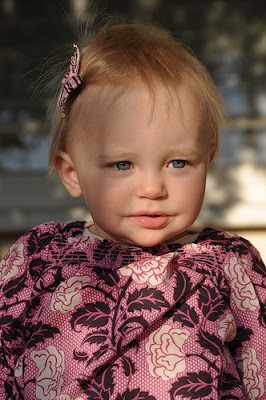 She reminds me of Lucy with her blondie hairs and big blue eyes. I'm sure they would be great friends. Fair warning if you plan to visit their site... it's terribly sad at first. Woefully unfair and just damned sad that such a thing had to happen to a man so desperately in love with his wife. But once you get past the initial sadness, Matt and Maddy are a great team who you, too, will most likely want keep an eye on. I'm right there with you. Such a heartbreaking story, but at the same time such a testament to how strong people can be when they have no other choice. I don't have many heroes in this world, but Matt is unquestionably one of them. Oh my goodness--thanks for the touching and heart wrenching link. I spent the morning crying at my computer over a subject that hits close to home. Oh no, I can't help but go look. I'm going to get tissues first. She is sooo beautiful. I adore Seraph and by saying this I don't mean that I am at all unsatisfied with him. But yeah, I want a girl too!!!!!!!!!!!!! Thanks for the recommendation. Although I might not be thinking that in about 20 minutes. I started reading the blog the other day and its heart breaking but I must say what an amazing dad he turned out to be! California born and raised; New Yorker by trial and error. Mother to a beautiful girl, wife to a brilliant professor and lover of a one-eyed rescue dog.